Various Reasons of Buildings Collapse you need to Know! Whenever a building collapses in any part of world, either old or under construction or under repair or during natural hazards like earthquake, or cyclone, it sends waves of tremors in minds of many common people around the world. People start thinking, can such a disaster happen with them and their family. Of course, there is no reason to be panicky as the rate of collapse of building to surviving buildings is negligible, but you cannot remain negligent, as it proves fatal and devastating for you and your entire family. Hence this is right time to know and understand the reasons for collapse of building and to take precautionary and remedial measures if at all it is applicable to you. Here we give a series of articles explaining reasons for collapse of buildings. In this article we are just listing 12 important reasons in brief. In a series to follow, all such topics have been dealt in details. Homogeneity and the integrity of either a structural or load bearing elements are most vital features of the building, which deals with the capability of building to survive against load without failure or collapse. There are various factors which reduce the load carrying capacity of building components due to the effect of ageing, wear and tear and environmental effects, etc. It may results into the loss of homogeneity and integrity of the building components and also it may lead to the partial or full collapse of building. Overloading also results in failure /collapse. Here we are dealing only with RCC framed buildings and not other framed structure or load bearing structure. Here are the reasons of building collapse which invites collapse either simply or mostly due to combination of more than one reason. Generally, collapse will not occur due to only one reason unless there is a gross error. Failure is a result of multiple reasons activating together. The sound architectural as well as structural design is very crucial for the most excellent performance and low maintenance of the buildings. Many times it is observed that the building collapses due to the error in design. The improper design decision will lower the quality of construction and lead to defects during the service life of the building. Violating codal provisions in name of economical or cheap design ignoring its long term effects is a faulty design and not an economical design. It will definitely invite problems. Sometimes the drawing with printing mistake or without marking the dimension in drawing or incorrect line, level or due to frequent revisions also lead to the poor quality of construction work which increases the probability of failure of the building or in defects. Read in detail how the building collapse due to defects in design and drawings. Inferior materials are those construction materials which do not meet the specification i.e. they lack in size or physical properties (weight, density, etc. ), lack of chemical properties, or substandard specifications. The use of inferior materials reduces the load-bearing capacity, i.e. the strength of building. In many parts of the world, particularly developing countries the major cause of the collapse of building is due to the use of inferior materials. Read in detail how the building collapse due to the use of inferior materials. The execution errors by the engineer onsite contractor, wrong decisions and supervision lapses of construction head, the stupidity of workers, and the lack of knowledge of standard construction materials and construction processes lead to the low quality of construction work. These deficiencies reduce the load-bearing capacity of the building in terms of strength and also reduce life and durability of the building, which may result in the collapse of building fully or partially due to lack of integrity and homogeneity. 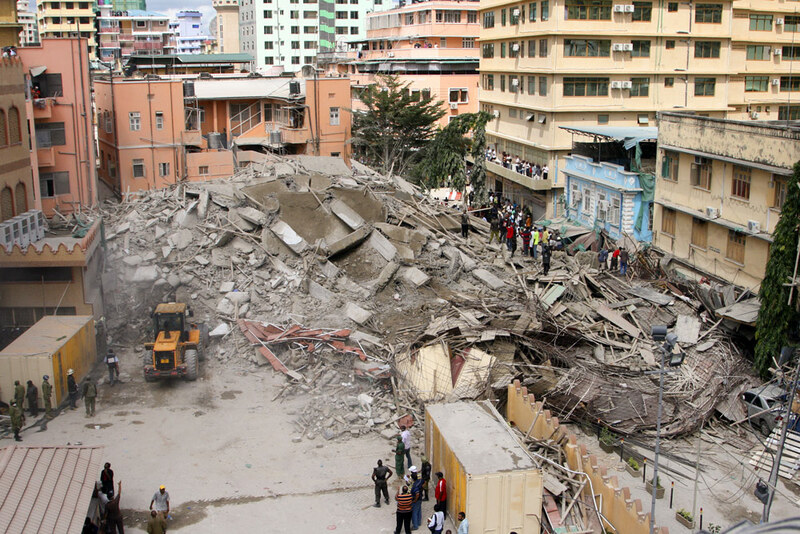 Read in detail how the buildings collapse due to faulty execution and inadequate supervision. The building may collapse fully or partially when unthoughtful alteration or unauthorised construction is carried out at the time repairing or restoration/renovation. During repairing or restoration or renovation, you are subjecting the building to additional load or are trying to change load path of the building or making certain elements under repair, redundant, I.e. they do not participate in resisting load). The change in load path causes excessive stress in structural elements which may be a reason for the collapse of building. Read in detail how the buildings collapse during repairing or restoration/renovation. All buildings are designed for the certain life, but sometimes they deteriorate early due to poor quality construction materials, defective construction techniques, substandard workmanship at the time of construction, violation of codal provisions, and inappropriate and unintended use of the building. Deteriorations result in the poor strength of the building component and hence it becomes the reasons for the collapse of building partially or totally. Read in detail how the buildings collapse due to their early ageing. Water leakages, structural or non-structural cracks, spalling of concrete or the honeycombed concrete, loose plaster are the damages of the building which deteriorates the structure. Deterioration of concrete or structural components results in the poor stability of the building due to loss of its proportions i.e. strength. If the buildings are not repaired intime or not maintained regularly, the damages will continue to increase and it may be the reason for the collapse of building fully or partially. Poor maintenance invites corrosion of metal item or carbonation of concrete or degradation due to sun’s heat or UV rays, all leading to cascading deterioration. Read in detail how the buildings collapse due to the lack of maintenance. Properly designed foundation resting on well-compacted soil at adequate depth increase the stability of the building for lifetime and reduce the risk of the building collapse. But sometimes the foundations of the building become critical due to resting the foundations on poor soil, or at an inadequate depth, or on the reclaimed soil. The foundation may also fail when the soil of footing base is not investigated properly, or they are placed in corrosive soil. Foundations of the building are also affected due to soil liquefaction during Earthquake. The error while designing the foundation also leads to the poor stability of the building. It is in this way that the building may collapse due to the failure of the foundation. Read in detail how the failure of foundations become the reason for collapse of building. Sometimes excavation for the foundation in just adjoining building/property causes the movement of the foundation of existing building. In most of the cases, the excavation near adjoining property causes the movements or sliding of the soil near or below the foundation of adjoining property and thus the footing of existing building may settle/sink/tilt immediately. It may lead to the collapse of building fully or partially sometimes immediately without giving warning. Read in detail how the excavation near adjoining property becomes the reason for the collapse of building. Buildings are always designed to resist the forces due to natural disasters like earthquake, cyclone, flood or fire but sometimes when the forces of natural disasters exceeds the designed limits, or if the structure is not designed to resist the excessive forces due to natural disasters then the building may collapse partially or fully and sometimes immediately without warning. Read in detail how the excessive forces of natural disasters become the reason for the collapse of building. Buildings are designed for pre-designed loads due to construction materials, loads due to occupants, furniture and loads that may come due to natural disasters like earthquake and wind etc. But the placement of heavy building materials, machineries, etc. at the time of construction or additional loads during the service life of the building causes the overloading which may cause the failure of the building. This may also happen when additional stories are built without assessing the strength of existing building. Any horizontal or vertical expansion not considered in original design may lead to overloading. Read in detail how the overloading causes the collapse of the building. Change in structural configurations i.e. basic vertical and horizontal load path like the horizontal diaphragm or vertical elements leads to deviation of the load path from the shortest load path. Sometimes such changes in load path increase the stress in the component, and which ultimately may fail. Sometime people remove column, beam or structural wall without considering its consequence and meet a disaster. During earthquake, the forces developed at different floor level are not transferred to the ground by the shortest load path due to the unsymmetrical configuration of building like unsymmetrical horizontal and vertical layout, irregular size etc. These unsymmetrical configurations of the building change the load path which results in the poor stability of the building. Thus the building may fail during the earthquake due to the unsymmetrical architecture configuration even though the structural design is otherwise good but for expansion joint, as it results in huge torsion. To avoid unsymmetrical configuration expansion joints should be provided. Read in detail how the buildings collapse during earthquake due to the unsymmetrical architecture configuration. Hence, whenever you see any sign of the distress/cracks or sign of instability in structure, immediately contact the competent and experienced structural engineer for the immediate remedial measures to prevent failure of the building. And of course always do regular maintenance.